Gap’s Athleta brand is a significant threat for Lululemon, but Lululemon might have a long-term edge over Athleta for one simple reason. lululemon athletica (NASDAQ:LULU) has a knack for making headlines for all the wrong reasons. This primarily stems from the company's miscues and concerning corporate culture. This, in turn, leads to many investors eliminating Lululemon from their watchlists. However, if you look at the numbers and the culture the company is creating among its customers, then it's a quality growth story. You could make many different bullish and bearish cases for Lululemon. In fact, it's one of the most enigmatic public companies in the world. In this article, we'll take a look at one reason to be bullish over the long haul. In order for a company to be successful over the long haul, it must establish a presence with younger generations. This leads to continued spending over the coming decades. In most cases, this pertains to millennials. Look at McDonald's as an example. McDonald's still has millions of customers, but millennials prefer fast-casual restaurants like Panera Bread and Chipotle Mexican Grill thanks to their better food offerings, better service, and more comfortable atmospheres. Lululemon already has the yoga-enthused millennials in its grasp, which is a positive, but Lululemon has taken it a step further. It's likely that you have never heard of Ivivva Athletica, but this is a Lululemon brand that targets girls between the ages of six and 15. Ivivva stores began opening in the United States and Canada in 2009; since comps skyrocketed 17% year over year in the most recent quarter, Lululemon plans to open more locations. To give you an example of Ivivva's social media and online popularity, the Ivivva Facebook page has close to 48,000 Likes, and Ivivva.com's global traffic ranking has moved up 76,276 spots to 291,638 over the past three months (Alexa.com). At the moment, there are 21 Ivivva showrooms and stores in the United States and 11 in Canada. If Lululemon's Ivivva brand continues to see success, it will provide Lululemon with a much-needed edge over Gap's (NYSE:GPS) Athleta brand. Here's why. Gap has more marketing power than Lululemon. Over the past year, Gap has generated approximately $1.7 billion in operating cash flow, far more than Lululemon, which generated about $261.7 million in operating cash flow over the same time frame. You could make the argument that Gap must use this capital for its variety of brands -- Gap, Old Navy, Banana Republic, Piperlime, Intermix, and Athleta -- in addition to returning capital to shareholders (currently offering a dividend yield of 1.9%). This is a justifiable argument, but Gap is a wise company that knows how much capital it should commit to a growth brand. Though Under Armour (NYSE:UAA) should never be underestimated, Lululemon and Athleta are the strongest players in this market right now. Despite similar materials for Lululemon and Athleta yoga pants, Lululemon is able to charge a premium thanks to the company's culture. In other words, customers aren't just paying for the pants but the experience, or membership, if you will. That said, Gap is a constant threat to Lululemon. By Lululemon establishing a presence with younger consumers, it gives Lululemon an edge going forward. In fact, Lululemon sees Ivivva as a significant growth driver. From an investing standpoint, if you want more diversification and marketing power at your side in the near future, then you will likely be better off with Gap. If you're willing to accept a little more risk while siding with more growth potential, then you should consider Lululemon. 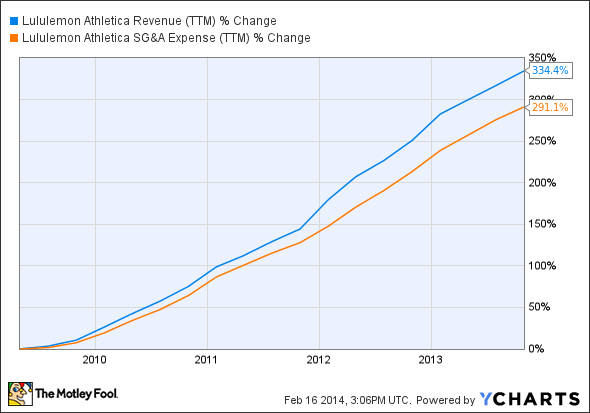 But ... is Lululemon as efficient as that other growth company mentioned above -- Under Armour? That's impressive. 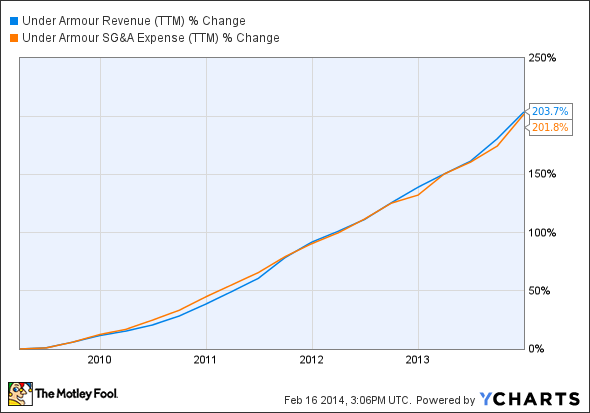 Lululemon's top line has consistently grown faster than SG&A expenses. What about Under Armour? Very good, but not quite as impressive as Lululemon. Additionally, Lululemon is trading at 23 times forward earnings, whereas Under Armour is trading at 46 times forward earnings. If you exclude negative headlines related to Lululemon, it's a phenomenal growth story. And its Ivivva brand might give it an edge over Gap's Athleta in the future. However, those consistent negative headlines should still give investors pause. Something is amiss with the company's corporate culture, which could be a red flag. On the other hand, if Lululemon improves in this regard, then it's a freight train that recently made a pit stop. Upside potential is certainly high. While Under Armour hasn't grown as quickly, been quite as efficient, and isn't as established in the yoga-wear market, corporate culture concerns don't exist when you invest in Under Armour. Please do your own research prior to making any investment decisions.